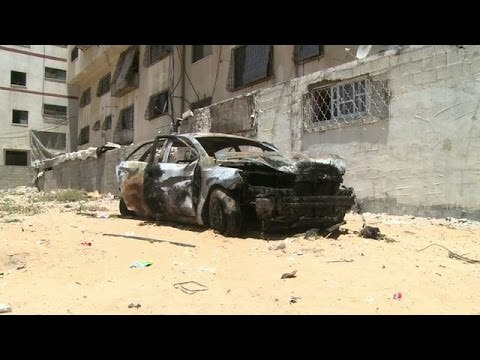 Did Daesh/ ISIL just hit Hamas in Gaza with Car Bombs? GAZA CITY (Ma’an) — Five car bombs targeting the armed wings of Hamas and Islamic Jihad went off in near-simultaneous blasts on Sunday morning in the center of Gaza City and its northern neighborhood of Sheikh Radwan. Witnesses said the explosions that went off at around 6:30 a.m. appeared to have been caused by bombs placed underneath the cars parked in front of their owners’ homes. Three of the cars were said to have belonged to members of al-Qassam brigades and two to members of al-Quds brigades, the armed wings of Hamas and Islamic Jihad. Graffiti on a wall near one of the bombs reportedly read “Daesh,” the Arabic acronym for the Islamic State group (IS), although no group has claimed responsibility for the attacks. “This morning, saboteurs exploded several cars of (members of) resistance movements in the Sheikh Radwan neighborhood, causing material damage,” Hamas police said in a statement. Since last summer’s devastating war in Gaza, there have been growing signs of internal unrest between Hamas security forces and other militant groups, with a string of small-scale explosions. Hamas has in the past cracked down hard on all Salafis, particularly as the religious group enjoys the support of Fatah. Experts warn that the appeal of extremist groups is growing, particularly among Gaza’s disaffected youth who have been particularly hard hit by conflict, grinding poverty and soaring unemployment and feel let down by traditional Palestinian nationalist movements. Growing extremism has led some to renew their call for an easing of the crippling Israeli blockade against the Gaza Strip in hopes that conditions will improve. Gaza’s border with Egypt also remains strictly controlled.